Our sightseeing in Jaipur ends by 5 in the evening and off we are to Chokhi Dhani village, a Confluence of Rajasthani village life, folk art, crafts, food and music. This place is around 15 kilometres from Jaipur on the Tonk Highway and it is around 7:00 PM by the time we reached there. Feel the pulse of authentic Rajasthani village culture at ‘Chokhi Dhani’, an Ethnic five star village heritage resort on the outskirts of Jaipur city. As soon as you enter this heritage complex, women decked up in Rajasthani attire welcome you by smearing your forehead with Tilak, while a shehnai churns out traditional welcome notes. It fills the entire atmosphere with a sense of energy and auspiciousness right at the entrance. This warm and traditional welcome takes every visitor into Rajasthan’s rich culture. What follows is a glass of hot rabri (not the one we find in Benaras as this one was made of maize) and then on to traditional Rajasthani music floating in the air. Walking little deep into this complex we start relishing different aspects of village culture. Dotted with Machaans (scaffolds), traditional huts, thatched roofs, and platforms, the entire place is lit up using traditional hanging lamps. Mud walls painted with ethnic wall pictures, present a rustic countryside appeal to this wonderful place. At different stages spread across a vast area, dancers are seen performing different folk dances of Rajasthan, be it Kalbelia or Ghumar. actually felt bad for them as folk art is getting lost in an age of consumerism. Live folk dances, astrologers, acrobats, snake charmers, camel and bullock card rides transport you into rich and vibrant Rajasthani folk culture making every moment a cherish able one. 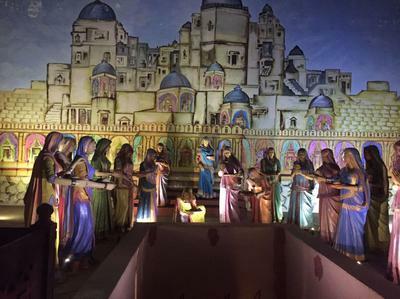 You can watch the famous puppet shows that showcase Rajasthan’s traditional folklore of Rajasthan. A man-made jungle trail with roar of animals, artificial pond and camel and elephant rides are some activities which children and adults enjoy. If you are tired of roaming around you can sit or relax at any of the traditional cots, stone benches or traditional bamboo chairs which are provided at every corner for the comfort of the visitors. Henna paintings and head massage are other interesting activities which you may want to indulge in. Exhausted after strolling through this sprawling complex? A traditional dining hall and an open dining area renowned for serving traditional Rajasthani culinary delights satisfy your gastronomic needs. You can either sit on the floor or on a chair with a small table and can enjoy sumptuous Rajasthani food flavours served in a brass Thali. Finally, we sit down to eat, and what a meal it was! The delicious cuisine of Rajasthan awaits you, with items ranging from dal-baati and churma to Panchkoota to gatte ki subzi to Panchkoota, to different kinds of rotis, daals, curries, rice, khichdi, to Rajasthani desserts to sweets, with most of items floating in ghee! The attendants at Chokhi Dhani make your dining experience a pleasure, by their friendly demeanor and actually make you overeat! As a result, by the time we get up from our seats, we are bursting at the seams. After having a great time you will never want to say good bye to this rich, vibrant and colourful place which is full of life and resonates with fun. It is the perfect place in Jaipur to feel the Rajasthani charm. There was not much that could be done other than going back to the guest house and crash. Sleep soon overpowered us and rightly so as the next day was going to be a hectic one as we were to leave Jaipur and proceed to Jodhpur.